As we bid the first month of 2016 goodbye, I’d like to thank all the patrons who help keep this blog running, including Aleena Tuabin, Steven Hopkins, and Space Queen Galacta Q! Thank you all for your continued support, and I hope to make my blog even better as time goes on! Warning: One of the stories discussed in this article features attempted group suicide and suicidal ideation. 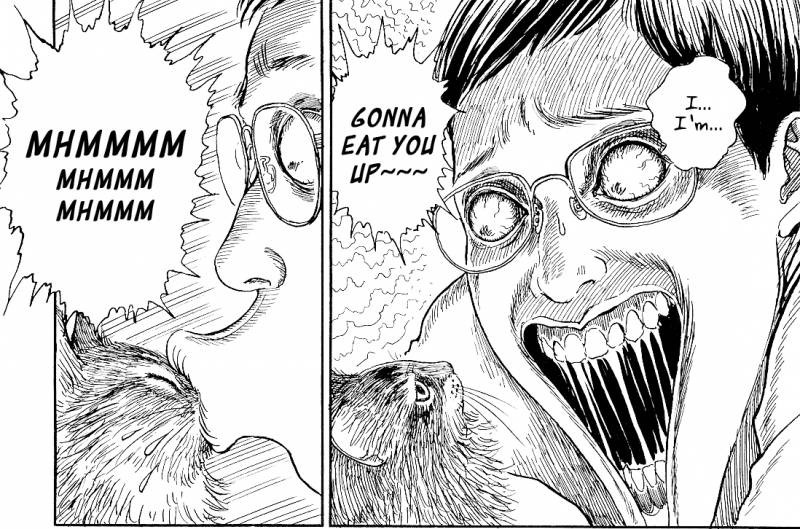 Now that I’ve explained numerous aspects of Junji Ito’s works (and why I love it so) I would like to provide readers with a few recommendations of Junji Ito works to read, so that you might continue reading further… at your own peril. For as well-known as Ito is for his horror stories, a surprising aspect of this author is how genuinely funny he is. One of the most infamous examples of this is in Junji Ito’s Cat Diary, an autobiographical tale about Ito and his wife adopting two cats. On the surface, it’s a standard story about a couple of cats. What makes it genius and hilarious, however, is that Ito does the series in his full horror style-complete with body deformation, intense shading, and selective use of detail. The result is a series which depicts a man’s love of his cat as horrifying, and hilarious, experience. 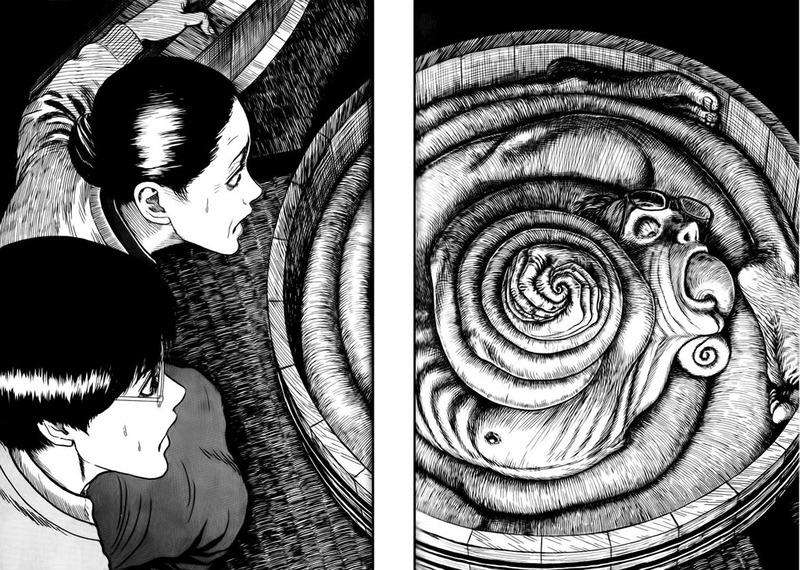 Spoiler Warning: The following article features spoilers for Town Without Streets and The Groaning Drain, alongside images from various other Junji Ito short stories. As much as people discuss the body horror aspect of Ito’s work, far less attention is given to the psychological aspect of his stories. Compared to his extensive library of body horror stories, Ito has done far fewer stories dedicated entirely to psychological horror. Those few that he has done, however, stand out as unique and interesting breaks from his usual format. One prime example of this being Town Without Streets, a story which seeks to personify social anxiety through justified fears of being watched. The main character escapes from a family that spies on her and memories of a boy sneaking into her room, only to find herself in a town where privacy is a myth and people’s homes are used as passageways. This is all very embarrassing but it seems in the hectic mess that was getting ready for Christmas and classes, I totally forgot to write a Patreon thank-you post for November. So this post will have to act as the thank-you post for both November and December! Without further ado, I’d like to thank Steven Hopkins, Aleena Tuabin, and Space Queen Galacta Q for sticking with me and continuing to support me as I bumble along! Spoiler Warning: The following article features spoilers for The Enigma of Amigara Fault, alongside images from various other Junji Ito short stories. It’s a bit late in the year for spooks and scares, but in lieu of other article ideas I’ve decided to spend a few articles focusing on one of my favorite manga authors: Junji Ito. 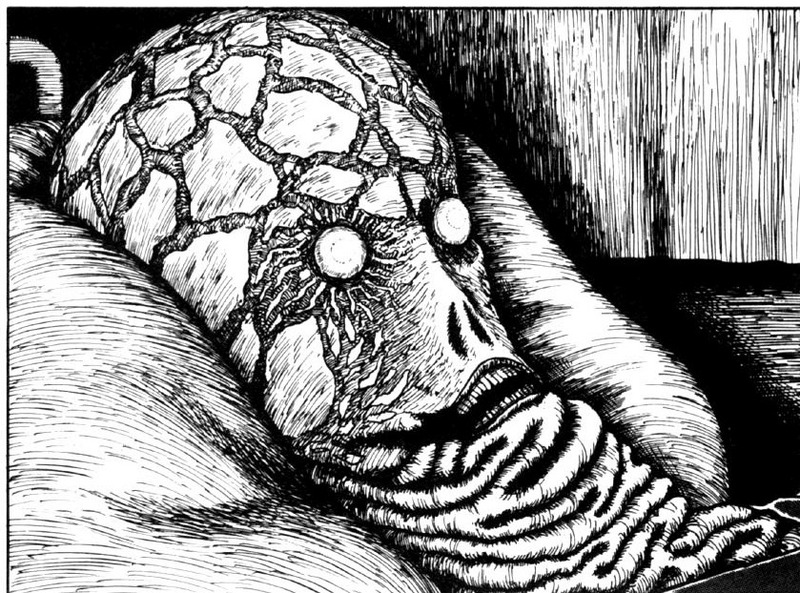 Junji Ito’s library of short horror stories is so massive and varied, it’s somewhat difficult to discuss exactly what I love about his work in one article. Thus, I’ve decided to break them apart into several articles, each focused around an aspect of Ito’s work. The first will be focusing on probably the most well-known aspect of Ito’s work: Body Horror.